In this 'Digital Next' era, the demand for content is at its peak, which in turn means that the amount of content produced is increasing. With the TV industry going digital, the rise of new Over The Top (OTT) video services is also generating further demand for content creation and delivery demand. Given such a dynamic shift in the content landscape, Media & Entertainment (M&E) organizations need to transform quickly into digital companies, managing customer, social, and digital assets while improving consumer engagement. The answer is simple - Silos. In M&E organizations, silos exist at the enterprise level, within departments, across content value chains and geographies.Be it broadcast or studio, investments are being made in silos leading to Islands of Automation —duplication of content, huge costs, lack of agility and collaboration. It is time for the M&E industry to undergo a transformation like other sectors. It is time for them to BE BOLD and TAKE THE LEAP to build a connected enterprise. If organizations have to succeed in this Digital Next era, they need to transform. Traditionally, global M&E enterprises have adopted a ‘local implementations’ route. This has resulted in multiple localized, non-scalable digital asset management systems across different departments and locations with poor upstream and downstream collaboration within creative and broadcasting or production systems. Broadcast enterprises do not have their MAM integrated sufficiently with Broadcast Management Systems (BMS) leading to additional cost and effort. The linear TV workflow uses multiple systems disconnected from one another. 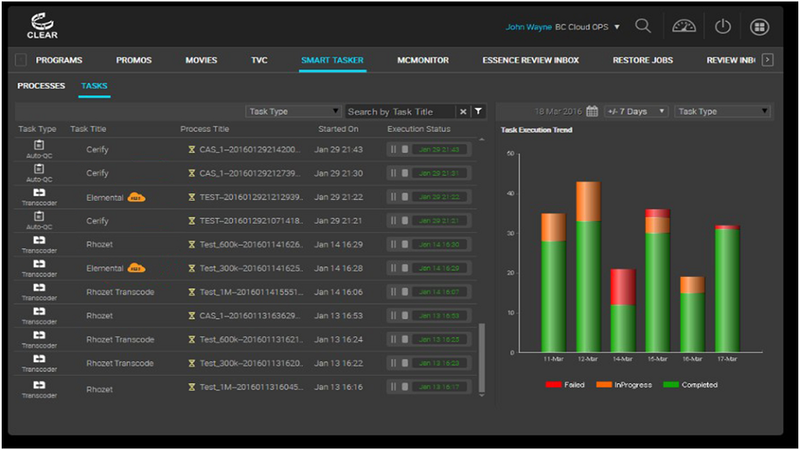 Similarly, Production workflows use one system where dailies & cuts are viewed and distributed for review. Promo workflows receive offline support or are through a different system. Finished content workflows are managed within the Broadcast Operations department in a different system. Digital departments are now emerging as an entirely new silo, to publish content on OTT platforms or deal with digital distribution. The problem is magnified if the Broadcast network is global! The technology stack gets replicated globally at each site, heterogeneously, only adding a multiple to the TCO. Learning from other sectors like Manufacturing, Auto and, Healthcare, M&E industry must adopt ONE software to not just function cost effectively, but also more efficiently with agility by leveraging Technology cleverly! BE BOLD and TAKE THE LEAP is a battle cry for M&E enterprises to adopt centralization and operate on the ONE MOMENT OF TRUTH principle. Part of CLEAR Operations Cloud, this newly added feature allows content owners to quickly repurpose content for distribution to web, mobile, VoD & IPTV platforms in a cost-efficient manner. Amazon Optimizer leverages the scalability and cost efficiencies of public cloud and delivers file-based video transcoding, auto quality control and compute intensive media processing tasks at the lowest total cost on the market. PFT's Operations Cloud uses a clever algorithm, batch.ly built by 47Line to optimally use a mix of reserved, on-demand and spot instances on Amazon Web Services to meet the Service Level Agreement(SLA) at the lowest cost. 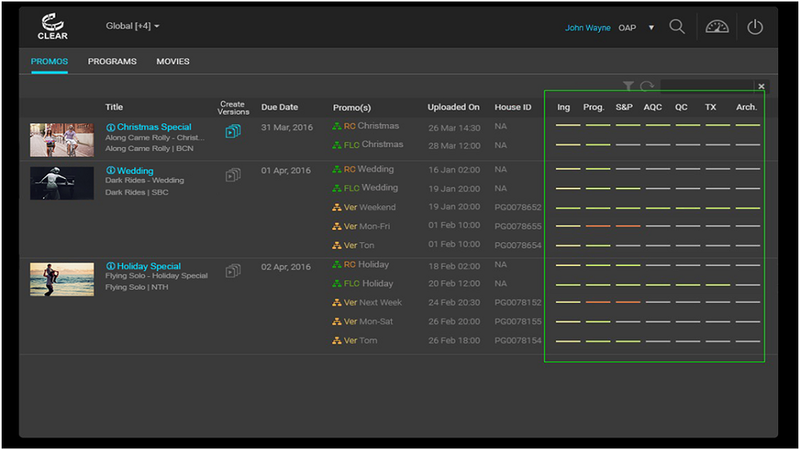 Part of CLEAR Broadcast Cloud, this module allows end to end business process orchestration for promo creation including planning through handing off versioned files to playout. This includes work order administration of multiple tasks, seamless integration with Broadcast Management Software (BMS), review and approval processes, post production, versioning and hand off versioned files for play-out. Extending the hybrid cloud capability, it leverages the Adobe Premier Pro machines at Broadcast Networks and automates the process of generating ‘versions’ using standard Adobe Premier Pro rendering. Part of CLEAR Cloud MAM, this functionality enhances the compliance led content preparation process. Through the Compliance Data Model, users will no longer be required to catalog assets multiple times for the same compliance parameter across various profiles. Instead, the user will be able to catalog once for each parameter, tied to each individual profile, and generate Edit Decision Lists(EDL) as required for specific certifications. For more information, visit the PFT team at NAB Show 2016, booth #SL10105.